...makes YOUR wedding a joyous, elegant event! "You get awards for 'Best Wedding Music'. It was an all-around delight." & Common Issues - Lots of Info Here! If you are getting married in a church, chances are that the church will require that you use their organist or musicians. 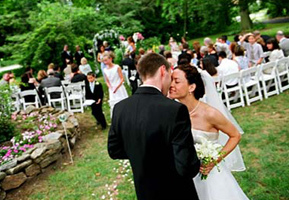 However, many couples today do ceremonies and receptions at sites such as inns, country clubs, and at private homes. In this case, we'd like to offer you our wedding ceremony services. Currently we do not have any of our classical & ceremony music recorded. We plan to have MP3 recordings up soon.